This class allows you to specify the source of your image. 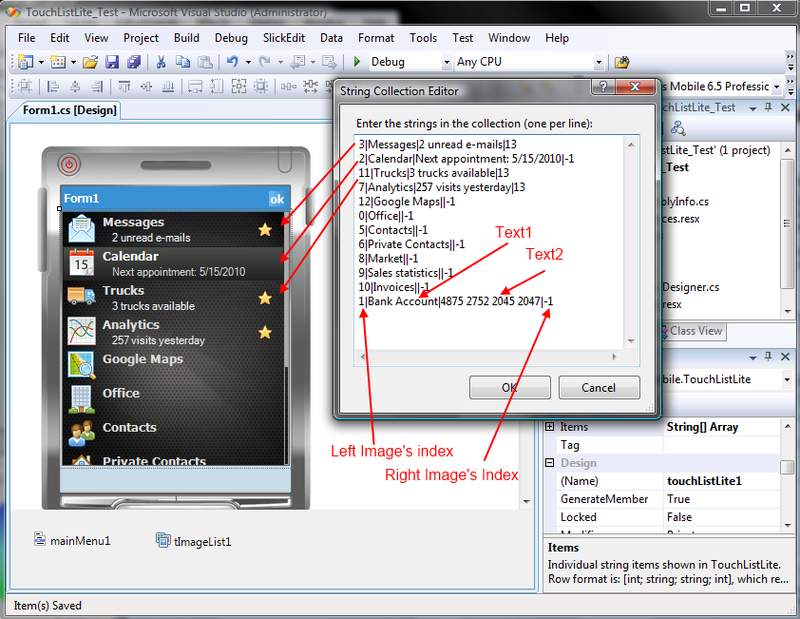 You can either load image from a file (ImageFromFile property) or from the resources (ImageFromResx property). 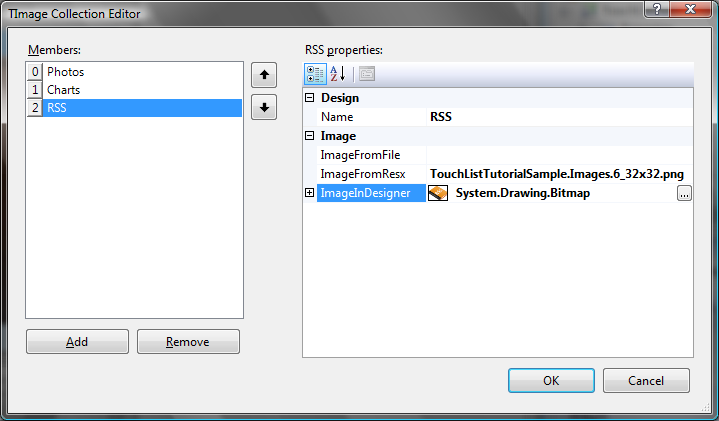 ImgeInDesigner property will be used for the Visual Studio designer only. It is a collection of TImage. You can create image list for QVGA resolution and a second image list for VGA/WVGA resolution. Before the application will display your TouchList control you can detect the resolution of your device and then use the right TImageList. Helps you to create a simple list with 2 transparent Image items and 2 Text items in a row. 1. 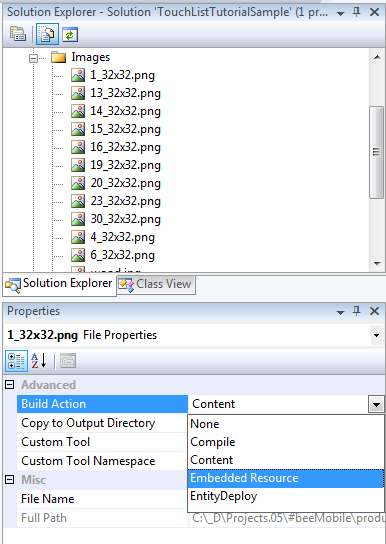 Add your images to the project and in Properties window set „Build Action“ to „Embedded Resource“ if you would like to store your images in resources, and set to „Content and Copy to Output Directory“ property to „Copy If Newer“ if you prefer to load them from your disk. 2. Drag and drop TImageList from your Toolbox into your Form. 3. Click on TimageList’s Images property to add your images. 4. Use ImageFromFile property if you prefer loading from file. The value of this property is the relative path to your application. How to set up my first TouchList? 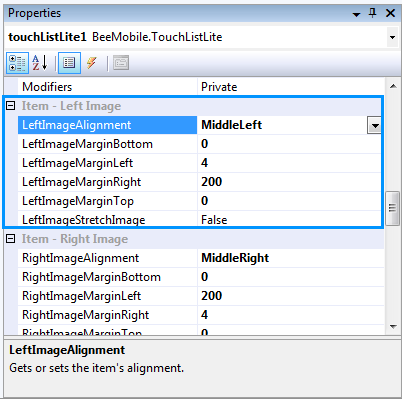 Drag and drop BeeMobile TouchListLite control from Visual Studio’s Toolbox into your Form, then click on Items property to open the editor and specify your rows. 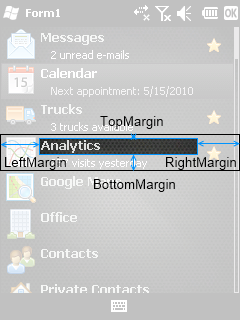 Margins help you to define area for an item, and you can prevent the intersecting of two items in a row. 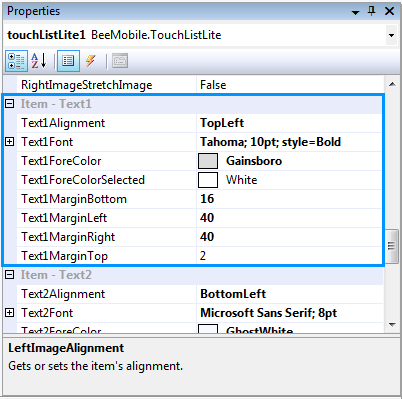 The Alignment property works in the specified area that you defined by Margins.